Few bands can claim to be either as prolific or as consistent as German heavy/power metal band Grave Digger. They’re up there with Rage as two of the most active and consistently great power metal bands, over an extremely long career. Celebrating their 38th anniversary earlier this year, Grave Digger has released 18 albums to date, managing to fit in at least once every two years since 1993’s The Reaper. They technically missed one in between 2014 and 2017 but did release a re-recordings compilation at that time, so one can hardly accuse the band of slacking off. Less than two years after the release of Healed By Metal, the band is back with their nineteenth full-length release, The Living Dead, set for release this week. 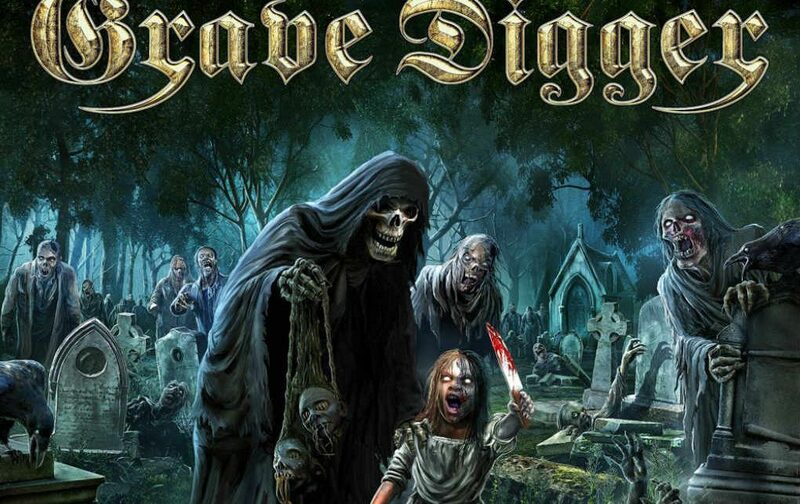 Their past few releases have been very strong, with the band seemingly turning back the clock to produce music every bit on par with some of their best work in the 90’s and early 2000’s, so I was excited to hear what this new release would bring, and it’s safe to say: Grave Digger isn’t just surviving, they’re thriving, in a big way! The band has developed their own signature sound over the past 38 years, playing one of the heaviest, most hard-hitting brands of power metal out there, with all their albums having some excellent guitar work and the ever rough and powerful vocals of Chris Boltendahl. Their past few releases, in particular, felt very similar to some of their classics from the 90’s, bringing back a lot of the raw intensity of those releases while adding in a bit more melody to make it just a bit more accessible and more modern sounding. All of this continues with The Living Dead, which once again contains a seamless blend between the band’s speedy power metal and slower heavy metal tracks, striking a perfect balance between the two, while also balancing nicely between heavy and melodic passages. I found Healed by Metal, in particular, had some huge choruses, and it generally felt like the band was making an effort to make their music just a bit more melodic, without sacrificing any of the riffs, and if anything The Living Dead has gone even further in that direction, featuring some of their biggest, most epic choruses ever, while still being as heavy and intense and fans of the band would expect. There’s certainly a ton of tracks here that will instantly remind fans of the band’s classic works while being just a bit more epic and catchy than usual. There are a few passages throughout the album that feel particularly fresh, and then there’s one specific track at the end that really takes things to a whole new level when it comes to surprising listeners, and I’ll get to that one in a while. Suffice to say, it surprised me in a great way. Performances are obviously strong across the board, and though longtime drummer Stefan Arnold parted ways with the band before the release of the album, he delivered one last great performance before doing so. Obviously, one element of Grave Digger that will never change, because it just wouldn’t be Grave Digger without it at this point, is the voice of Chris Boltendahl. He has a very raw, raspy voice that sounds rather unique within power metal, and he brings a level of aggression and intensity not often found within the genre, yet he manages to make it work equally well on the faster, more power metal focused tracks, as well as the slower, more heavy metal tracks. His voice sounds as strong as ever on Fear of the Living Dead, and he does an amazing job on some of the bigger choruses, proving he still has what it takes to carry a band as well as anyone in the genre. For a band that’s been around so long, you’d expect Grave Digger to struggle with songwriting at least a little bit, and yet that really isn’t the case. They had a bit of a rough stretch from 2005-2009 with a couple of slightly weaker albums, but they returned to form nicely in 2010 with The Clans Will Rise Again, and have been on another great run ever since. The streak continues with The Living Dead, which is consistently excellent from top to bottom, while still having a few particularly strong tracks that rank among my favorites by the band. First up is one such highlight, that being the title track. The track opens with a baby’s lullaby gone wrong before the riffs kick in and it turns into the kind of hard-hitting, speedy opener the band excels at. It slows down during the verses but still keeps the energy up with some great riffs, before speeding up again, for a huge, extremely epic chorus, which certainly stands among the band’s best in that department in quite some time. It manages to be equal parts, intense, epic, melodic and super catchy, and definitely gets the album off to an amazing start. Next is “Blade of the Immortal”, a slower but equally hard-hitting track, with some very punishing riffs right off the bat, as well as another super epic and fun chorus, and an excellent instrumental section which has some rather unique melodies coming from Grave Digger. Overall, it’s an excellent track which blends classic Grave Digger with some fresh sounds in a great way. After that, the pace picks up again with “When Death Passes By”, another heavy track which stays pretty fast-paced throughout, delivering another fast and super fun chorus, as well as some excellent lead riffs and very fun verses. It’s certainly one of the more classic feeling songs on the album, in a great way. Some surprises come on “Shadow of the Warrior”, an epic track which starts out with a soft acoustic section, featuring some surprisingly calm vocals from Chris, before the riffs kick in and it starts moving at a nice pace, without going full speed. It has another very melodic, super catchy chorus, which ranks as one of the best on the album, and it has some more rather unique and awesome melodies during its solo section. Another excellent track. There’s a couple tracks here will silly lyrics, as expected. The first of these is “The Power of Metal”, a fairly fast and hard-hitting track, which again mixes classic Grave Digger riffs with a big chorus. The lyrics get in the way slightly during the verses but are funnier than anything, and the chorus is amazing, so it’s still a great track overall. The other track with kinda silly lyrics is “Fist in Your Face”, which stays silly throughout, but thankfully it’s an excellent track musically, with some extremely powerful riffs and is an example of the band playing slow paced but energetic classic heavy metal at its best. In between those two are two more excellent tracks in “Hymn of the Damned”, another very classic sounding speedy power metal track with raw sounding riffs and a huge, epic chorus, and “What War Left Behind”, a very thrashy power metal track, which may be the most classic sounding track on the whole album It’s certainly very raw fast and energetic, in an awesome way. Moving to the final stretch of the album, “Insane Pain” is another very raw and heavy track, which stays fairly fast during the verses, but slows down for a fun chorus. It’s not one of my favorite tracks here, but it’s still excellent and has some great riffs. There’s a very good bonus track called “Glory or Grave”, which is very speedy, hard-hitting and has an extremely epic and catchy chorus, so it definitely fits in perfectly with the rest of the album. One song that doesn’t quite fit in, but is a pleasant surprise, is the closing track “Zombie Dance”, released as the second single, after the title track. It’s a mid-paced, slightly upbeat heavy metal track with some heavy riffs during the verses, and a stupidly catchy chorus, but what really makes it stand out is the fact that the band called in Austrian Russkaja to provide some folk influences to the music, delivering some epic chants as well as some backing music that strikes a balance between folk and polka, giving the song its aforementioned “Dance”, which also factors into the lyrics during the chorus. It gets even weirder during the middle section, and overall it’s a very bizarre experiment, which somehow works out perfectly and is probably the most unique and surprising thing the band has done in at least 15 years. Overall, The Living Dead is an amazing album from heavy/power metal veterans Grave Digger, which continues a big resurgence they started eight years ago, and if anything, takes things even further, thanks to a delightful mix of the kind of classic, hard-hitting power metal and heavy metal the band excels at with some of the more melodic tendencies the band has picked up on more recent albums, as well as one hell of an epic surprise in the closing track. Obviously, it’s a must buy for any existing fans of the band and in case there’s anyone looking for an aggressive mix heavy/power metal who hasn’t heard of Grave Digger yet, this would certainly be a great album to start with. Well, what do we have here? For a second there I was taken back in time to perhaps some old school Scorpions material?, the addictive hooks of Def Leppard perhaps? Grand Design busts onto the hard rock scene with those comparisons from the onset. A little of everything found on the album “Time Elevation” by the Swedish hard rock combo Grand Design.